Breastfeeding is not a walk in the park. In order to provide our children with the optimum health and foremost care, we would need to make changes in our lifestyle. One of which is for nursing mothers to self-regulate their intake of alcoholic beverages for the safety of their babies. Among the side effects listed by The American Academy of Pediatrics Committee on Drugs are drowsiness, weakness, deep sleep and abnormal weight gain on infants if large amount of alcohol is consumed. Add to that the fact that consuming too much alcohol may impair the mother’s ability to breastfeed as alcohol can cause drowsiness, inhibiting the mom from responding to her child’s need to nurse while she in under the influence of liquor. Although there are many conflicting information on the mix of alcohol and breastfeeding, it is a known fact that the consumption of alcohol has adverse effects on our normal bodily functions. 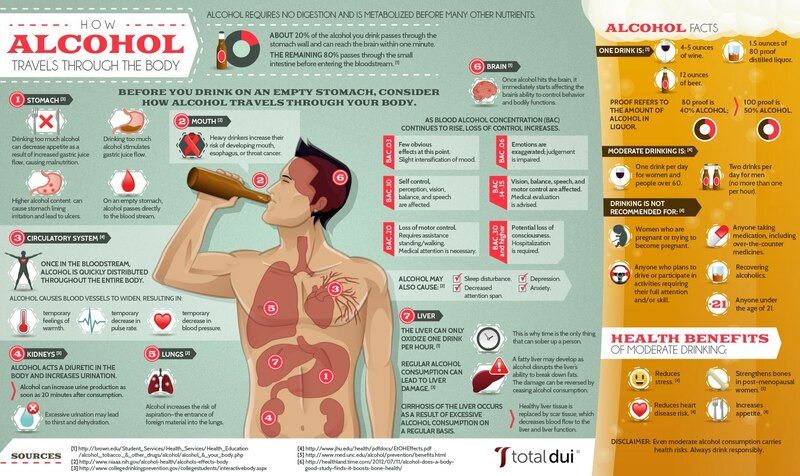 Consistently downing alcohol has negative effects on our vital organs such as the brain, heart, kidneys and liver. With this in mind, when we take in alcohol, we carry it not only in our bloodstream, but in our breastmilk as well. We will be discussing the correlation of alcohol and breastfeeding, its effects on the breastmilk, the mother’s milk supply, and ultimately to the baby. Big Question: Does Alcohol in Breastmilk Affect Baby? The answer to this question lies on the amount of alcohol ingested by the mother. An excerpt from the book written by Thomas W. Hale, R.Ph. Ph.D., member of the La Leche League International Health Advisory Council entitled, Medications and Mother’s Milk says “Excess levels may lead to drowsiness, deep sleep, weakness, and decreased linear growth in the infant. Maternal blood alcohol levels must attain 300 mg/dl before significant side effects are reported in the infant. Reduction of letdown is apparently dose-dependent and requires alcohol consumption of 1.5 to 1.9 gm/kg body weight (6). Other studies have suggested psychomotor delay in infants of moderate drinkers (2+ drinks daily). Avoid breastfeeding during and for 2 – 3 hours after drinking alcohol.” Read more about this study here. So the key here is to moderately consume liquor, and time the consumption after the baby has already nursed, and would not need to do so for the next two to three hours. The ideal time then to have an occasional drink is past the baby’s bedtime. There are many facts about breastfeeding and it is important for any mother to discern the information she comes across with. Information coming from breastfeeding institutions and reputable health organizations then should be the source of valuable breastfeeding information. 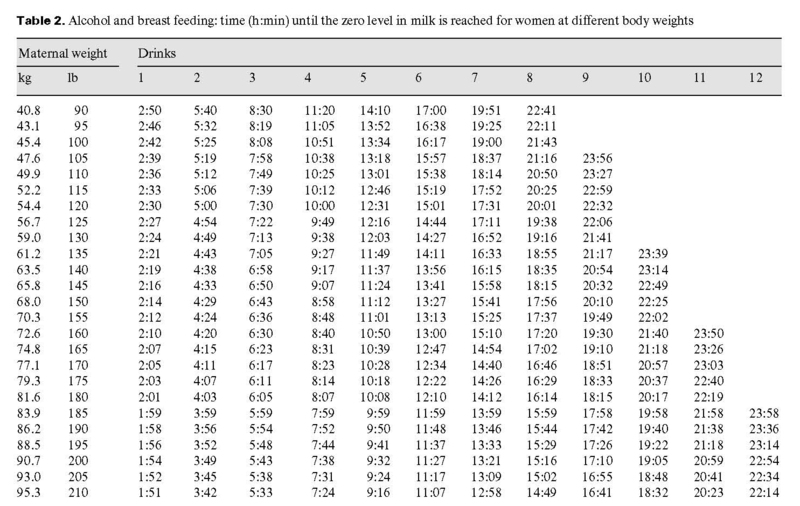 More importantly, mentioned also in Medications and Mother’s Milk, adult metabolism of alcohol is approximately 1 ounce in 3 hours, thus, moderate amounts of alcohol ingested by nursing mothers may return to breastfeeding as soon as they feel neurologically normal. There is also no need to pump and dump after drinking alcohol beverages. It should be noted that there is no need to throw away your breastmilk upon consuming alcohol. “As alcohol leaves the bloodstream, it leaves the breastmilk. Since alcohol is not “trapped” in breastmilk (it returns to the bloodstream as mother’s blood alcohol level declines), pumping and dumping will not remove it. Pumping and dumping, drinking a lot of water, resting, or drinking coffee will not speed up the rate of the elimination of alcohol from your body.” Read more on this from the La Leche League FAQ Page here. If you do decide to drink alcohol while you are nursing your baby, you should plan ahead of time and make sure that you are equipped with correct information as well as the consequences of excessive levels of alcohol intake. Whatever part of the world a mother hails from drinking alcohol is not uncommon especially during social gatherings. It will be understandable if a mother would like to unwind and have a drink or two given the many stresses that comes with parenting, as well as the need to socialize with friends and family. And for the regular drinker, nine months of staying away from liquor due to pregnancy may be too much, so wanting to have a drink a few months after giving birth is understandable. The key to drinking while breastfeeding is to know the facts and observe proper guidelines. We have collated some information you may need when consuming liquor during the course of breastfeeding an infant. The website Motherrisk.org shared a Drinking and Breastfeeding chart that mothers can use as a guide when having their regular or occasional alcoholic drink. This chart is a guide for nursing mothers who would like to know more information on the appropriate consumption of alcoholic drinks. You may print the chart from this link. A similar chart has been posted by the Australian Breastfeeding Association. They came up with a helpful brochure featuring a Drinking and Breastfeeding Chart as posted in its website. For mothers who are bound to get confused when consulting an alcohol and breastfeeding chart, then a breastfeeding alcohol calculator may be a great way for you to check when alcohol has already been eliminated in your body. The website Mommymeds.com has this online breastfeeding and alcohol calculator. Click here to check it out. Usually, a drink consists of either 12 ounces of 5% beer, or five ounces of an 11% wine, or 1.5 ounces of 40% or an 80 proof liquor. The time on the other hand is measured when the mother starts consuming the alcoholic beverage. 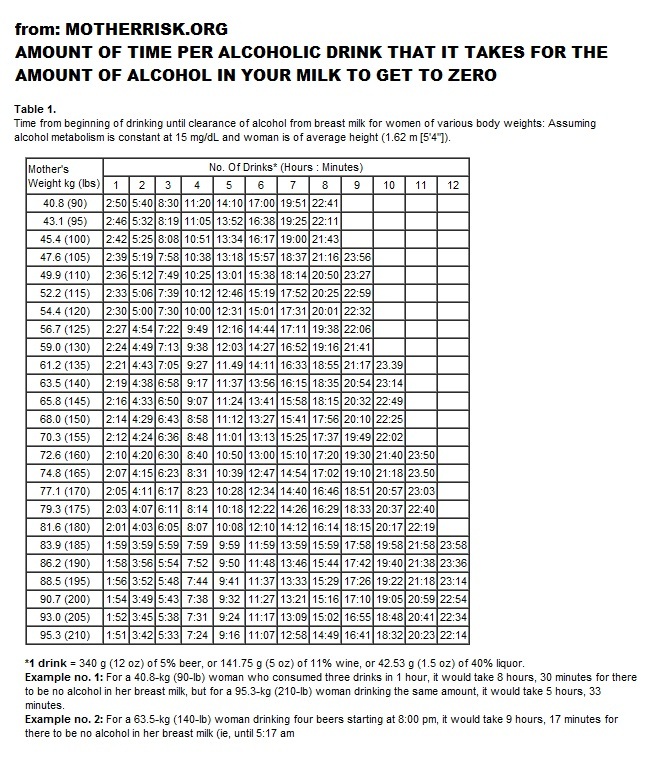 Another alcohol calculator you may want to check out it from Obfocus.com. This calculator estimates the time the alcoholic beverage is eliminated in the breast milk after consumption. Thus, the milk supply of lactating mothers is affected. Studies have shown that it impacts the balance of hormones that control breastmilk production. Moderate supply reduces oxytocin levels affecting milk supply and let down. Oxytocin is a hormone produced by the pituitary gland to regulate two female reproductive functions: Child bearing and Breastfeeding. Gender : Alcohol is known to stay in a woman’s body longer than it does in men as women’s body has more fat than water. Age : The younger you are, the faster your body gets rid of the alcohol. The NHS says other health issues may affect the body and may differ from person to person. For example, if you have a problem with your liver, you will have a harder time to remove the alcohol from your system. Can I have one beer while breastfeeding? The good news for moms inclined to having a beer or two while breastfeeding is that yes, they can indulge on a beer or two. This is because there is a certain level of alcohol consumption that can affect the baby, but definitely, one can of beer will not. More than two units of alcoholic drink a day though will impact the baby’s development according to the Breastfeeding Network and UK’s National Health Service. Chronic exposure to more than two units of alcohol per day may have an effect on the baby’s development. Maternal blood levels have to reach 300mg/100ml before mild sedation is reached in the baby (this compares with a level of 80mg/100ml needed to fail the police breath test). Is there any positive side effect? Traditionally, beer was thought of as having a positive side effect on a mother’s breast milk supply. But all the same, alcohol has been shown to reduce the volume of breastmilk supply. The pervading thought in some cultures though that malt in beer may be a galactogogue – or a substance that helps increase breastmilk production may no longer be as true today. This is because the beers that were manufactured many, many years ago were made of grains and herbs that are no longer present in the commercially prepared beers of the present time. This “small beer” then is no comparison to the beers of today that do not have any lactogenic effect. Non-alcoholic beers however that are being sold in stores can be checked if they are rich in barley and hops as these grains are great in helping push milk production. As a general rule, anything in excess always has an adverse effect on your bodies and in effect, have an impact on your baby’s health. The baby will be slower to reach developmental milestones as well as other health issues. Remember that your baby’s survival lies in your hands. They rely on you to provide them with optimum health and the best care. Alcohol may affect the baby’s sleep pattern as suggested in a study of mothers who are light drinkers. Regularly consuming alcohol may cause slow weight gain on the infant. Daily alcoholic beverage consumption of at least one drink daily may affect the infant’s gross motor development. Alcoholic intoxication may impair the mother’s ability to respond to the nursing needs of her child during the period of her intoxication. She may also not be physically sound enough to take care of her child because she will likely be exhausted and drowsy to do so. Moreover, she may not feel well the next day, and may remain unable to take care of her child for the first few hours of having a hang over the next morning. Read more facts from Kellymom.com here. If you could avoid having an alcoholic drink whether it may be a sip or a single glass, then all the better. But, an occasional celebratory single, simple alcoholic drink is acceptable. Alcohol abuse or binge drinking is irresponsible. You would need to nurse your baby before you decide to drink alcohol in order to minimize the alcohol your baby will get. You may start breastfeeding again after two to three hours so when your milk is alcohol free. It’s important for you not be intoxicated as you will not be able to feed your baby properly, thus, you will not be able to ensure that your baby is taking in ample amount of nutrients from your milk. Nursing moms who are chronic or consistent alcohol drinkers must avoid breastfeeding their babies and immediately seek help from their doctors.